Fukuoka is the largest city in Kyushu and offers a diverse culture. It was awarded one of the top 25 most liveable cities due to its food scene, shopping districts, transportation, cultural activities, green spaces, cleanliness, and fresh ocean air. Fukuoka is a popular tourist destination with many of its travelers coming from nearby South Korea, Taiwan, and China. One of the most prominent symbols in Fukuoka is the abundance of Yatai, or open-air food stalls, that you can find scattered across the city. Yatai are popular in the evenings and generally serve up quick dishes such as yakitori, oden, and mentaiko. Just take a stroll through Nakasu Island in the middle of the city to find many Yatai lined up in a row! You may also be familiar with Fukuoka for its famous tonkotsu ramen! Tonkotsu ramen is made up of a rich and milky pork broth and typically thin noodles that are hard in the center. 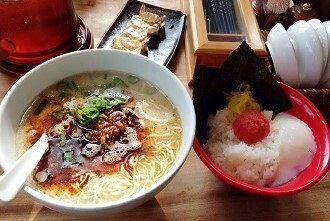 This specialty is often referred to as Hakata ramen, named after a popular district in Fukuoka. You won’t want to miss this metropolitan city and all its character! For more information about schools in AEON’s Kyushu area click here. For more information about AEON from current and former teachers, see AEON’s reviews on Glassdoor.